In India, we are habituated to the process of growing up listening to stories. Panchathanthra and Aesop fables are the ones that children are exposed to at school. But till then, it is always mythological stories. When a lady is pregnant, everybody asks her to read mythological stories. They say that the baby in the womb can hear what is being read and said. They refer to Abhimanyu of Mahabharatha fame who learnt to decode Chakravyuh when he was still in mother’s womb! And so much more… So much more!!! We are brought up listening to such stories… How the life should be led is taught through mythological stories. We are told that somebody is always watching which makes us think twice before doing anything. In short, we understand life though such mythological stories. We are taught not to question its authenticity. We are asked to take the good things from it and follow it with faith. 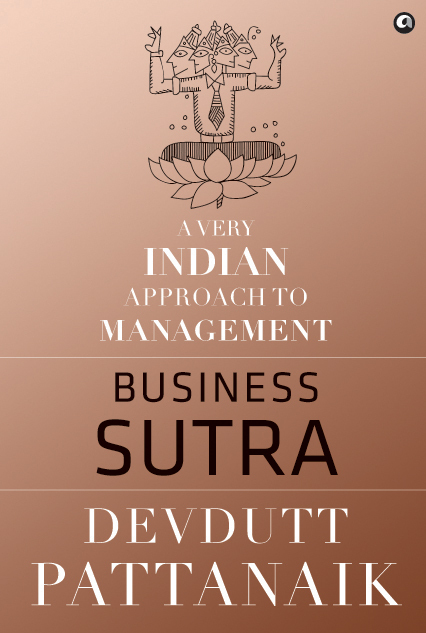 Devdutt Pattanaik takes that seed of belief a step forward in his latest book named Business Sutra. How to conduct ourselves in a corporate environment is what is dealt in book. The first few pages in the book are very slow moving. The author details a little too much elaborating what he is trying is convey through the book. He has elaborated too much that we feel bored. It further tends to look preachy almost like a classroom lecture. Once you endure that pain given by the first few pages, the best part of the book begins. The diagrams used makes the concept easy to understand and interesting. Most of the explanations startle us because we have always come across those in our day-to-day life yet went unnoticed. The last few pages are really swift. It narrates a portion of some mythology and goes further explaining what can be learnt from it in a business angle. I liked this portion of the book most. It gave a chance to refresh our memories on such mythological stories and at the same time see the same in a different perspective. 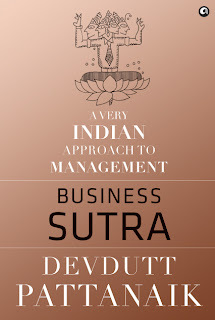 In short, the concept of Business Sutra is unique and extremely relatable. It is a new way to learn about the wide range of religions and the Gods around us. The book has about 450 pages and being a non-fiction it invites boredom most of the time. Go for the book if you like to read Managment books and non-fictions. 1. It is penned by an Indian author!!! 4. The book binding is very sophisticated. It makes the book more serious and formal. And Blogadda… Thanks for being so generous. I am happy and elated!